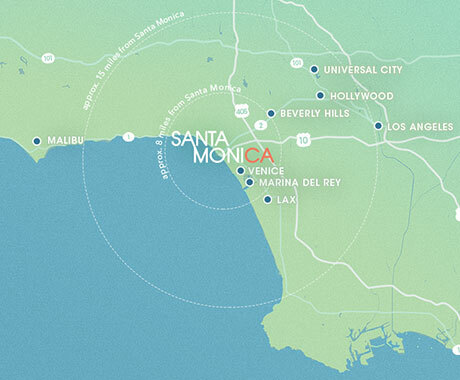 Having fun in the beach city of Santa Monica doesn’t have to be costly. 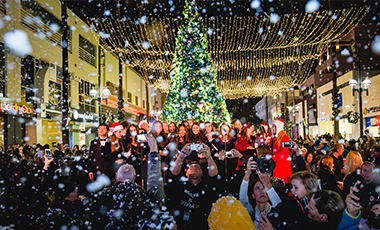 With year-round activities and events, there are plenty of things to do throughout the year that won’t break the bank. Here’s a rundown of one free thing to do or can’t-miss activity happening each month in Santa Monica. Although it may still be winter, Santa Monica’s beautiful weather and over 300 days of sunshine make it the perfect destination for free outdoor fitness any time of year. 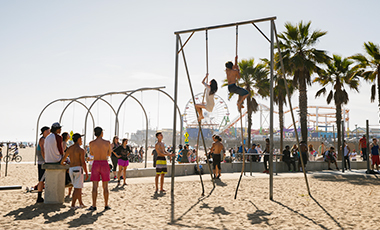 Stick to those New Year’s resolutions to get fit by cruising down the Marvin Braude Bike Trail and make a stop at the Original Muscle Beach, Santa Monica’s open-air gym with chinning bars, parallel bars, rings and a small jungle gym for children. 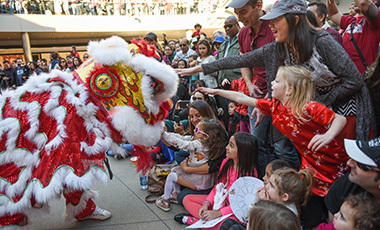 Celebrate the Lunar New Year, on February 16, in Santa Monica with cultural entertainment, performances and activities at Santa Monica Place. The free event features traditional dragon dances, classical Chinese music, ribbon dancers, stilt walkers and more. 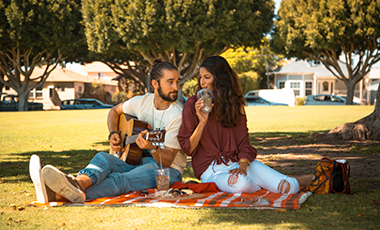 Enjoy the outdoors at one of Santa Monica’s parks. 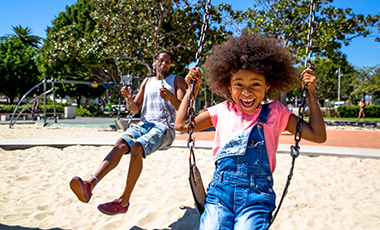 Virginia Avenue Park has two playgrounds, a seasonal splash pad, basketball courts and outdoor barbecue grills with a large lawn area – perfect for a free family outing. There’s also a weekly farmers market on Saturdays. Window shop along Montana Avenue, a 10‐block, tree-lined street frequented by affluent Angelenos and well-informed visitors. 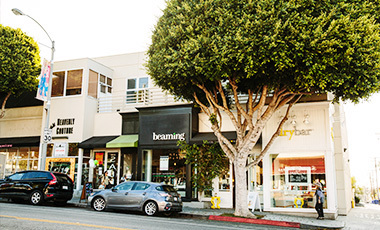 This upscale shopping district is flush with stylish boutiques, healthful cafes and is the perfect location for a leisurely stroll. While perusing the avenue, don’t miss a stop by the Aero Theatre, which originally opened in 1940 as a 24-hour movie theatre for the Douglas Aircraft Company workers who worked in shifts around the clock during World War II. 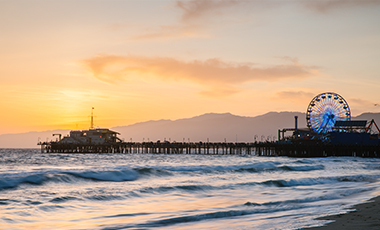 As a West Coast city, Santa Monica’s location makes it one of the most beautiful sunset-seeking spots along the Pacific. Don’t take another sunset for granted! 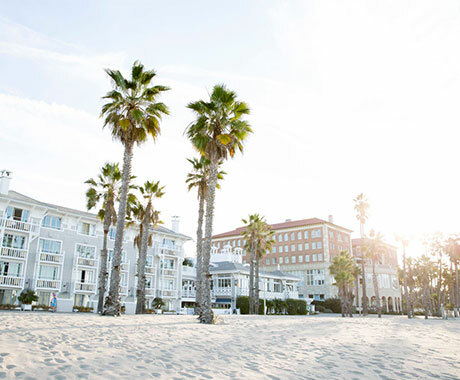 Grab a blanket and pick a seat on the Santa Monica Beach for a breathtaking view or see our list for some of the locals’ favorite spots. To kick off the summer, Main Street will be hosting the annual Summer SOULstice festival on June 23. Come and enjoy a fun day full of free live music, local vendors and activities for everyone. 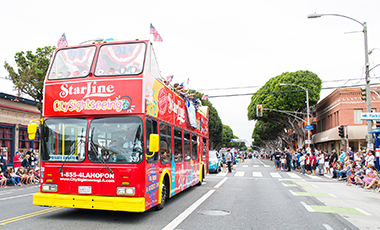 Main Street is transformed into a patriotic celebration during the Santa Monica Fourth of July Parade. This annual event brings together the local community and features a variety of local participants, from school marching bands and vintage cars to city floats, musicians and more. Grab friends, family and a pair of dancing shoes for free concerts in the park. 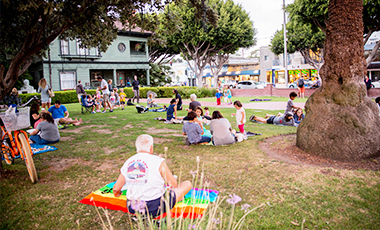 Jazz on the Lawn happens every Sunday in August and features an array of live jazz music, free dance lessons, intermission performances, and some of the area’s finest food trucks. 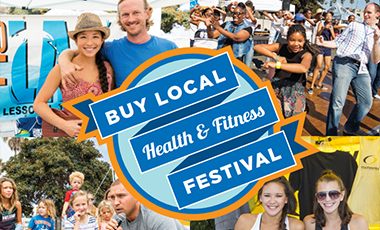 The Buy Local Health and Fitness Festival, in early September, is a fun day full of music, pop-up shows and interactive classes. Local businesses provide expertise, advice, health screenings and free product samples to promote a healthy and happy lifestyle. As the summer comes to a close, the fun doesn’t stop in Santa Monica. 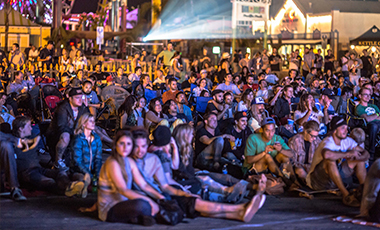 In October, Front Porch Cinema is hosted for free on the Santa Monica Pier which is transformed into the perfect setting for a movie night under the stars. There’s even “old-timey lawn chairs” to relax in. 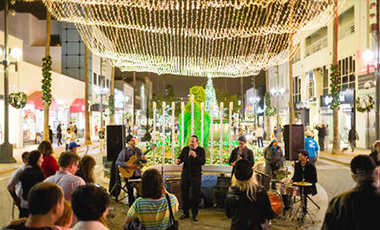 From the Main Street Holiday Party and Montana Avenue Holiday Walk to the Pico Trio Holiday Celebration and the Menorah Lightings on Third Street Promenade, the holidays festivities in Santa Monica are endless. Visit the holiday specials page to explore all of the (many free) events, Christmas and Hanukkah menus, hotel deals, and seasonal specials happening throughout the city.